Looking for a New Mercedes-Benz E-Class in your area? CarGurus has 389 nationwide Mercedes-Benz E-Class dealers with 9,982 new car listings. Mercedes-Benz offers the 2018 E-Class as the ultimate midsize luxury car for the ultimate price. You get what you pay for. For a Mercedes-Benz E-Class, you’ll pay a lot, but the reward will be owning one of the finest luxury cars on the face of the planet. The only reason to shop around is if you can’t afford one, and let’s be straight, has anyone gotten out of bed and said, “I can’t wait until I can buy an Acura TLX!”? While the latest E-Class is technically in its fifth generation, Mercedes has been making midsize sedans since the 1950s. It’s been in business for 130 years. The Germans understand luxury, and after you drive the new E-Class, so will you. No new car on sale is so drastically different from its predecessor. The W212 E-Class (2010-2016) was angular, creased, and upright in the formal Mercedes tradition. This new W213, like the new C-Class, has no blunt edges. The exterior’s smooth stampings are practically liquid in form. Curved, double-bar LED running lamps slowly rise to full brightness when unlocking the car, the LED taillights are reflected in a crystalline texture to appear as “stardust,” and the key fob resembles a polished black gemstone. It’s impressive without even opening a door. Once inside, the E-Class is a VIP lounge at a boutique hotel. The sprawling, sweeping expanses of inlaid wood, Bentley-like swiveling round air vents, giant high-res screens, bright LED mood lighting in 64 colors, and two-tone leather color combos that belong on a yacht (cream and milk chocolate, anyone?) have no equals. 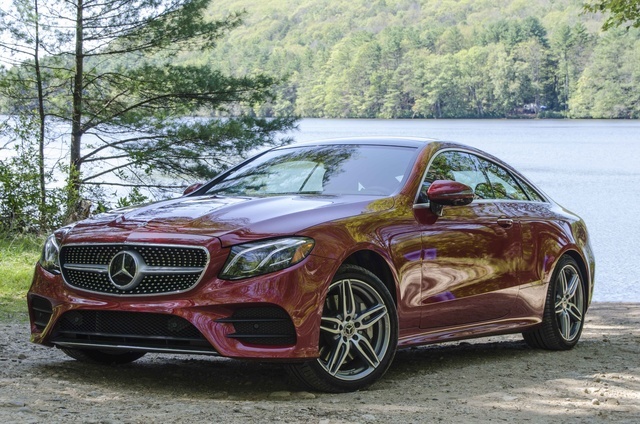 I tested two E-Class models over two weeks for this review, both in Designo Cardinal Red: a 2017 E300 sedan in Germany and a 2018 E400 4Matic coupe in New England. 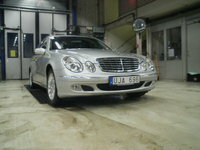 An E400 wagon is also available, along with mad AMG versions of the sedan (E43 and E63). Next year comes a convertible. The coupe pictured here shares the front half of the sedan’s interior, save for finned air vents and aggressively bolstered sport seats. The pillarless design (there is no metal support at the middle, or “B” section, of the body) is elegant, with powered rear half windows. Wide taillights, a unique rear fascia, and a more pronounced grille distinguish this large two-door. Only E300/E400 sedan and E400 wagon models come with the optional Luxury Line, which replaces the exaggerated Mercedes logo with the company’s classic thin-lined grille and a standing hood ornament. I’m told younger buyers prefer our coupe’s “sport” styling, but don’t kid yourself. The E-Class is not a showy performance car and deserves the Luxury Line’s understated, richer style. The E-Class has no trouble performing, but you’ll have to prod it. As with the previous generation, the new E-Class dozes off in its default Comfort setting, the 9-speed automatic reluctant to kick down even when you’re deep in the throttle. It’s awake in Sport and fully caffeinated in Sport+. All five drive-mode settings (including an Eco and a customizable Individual mode) vary the throttle, transmission, and steering response. They also alter how softly or firmly the car rides on models with the Airmatic air suspension or the AMGs' adjustable dampers (our cars didn’t have them). Even with run-flat, low-profile tires, our E400 delivered a near-perfect balance of comfort and agility, with only a few bad surfaces sending shudders through the cabin. While the sedan allows more body roll than the coupe, both cars are composed around fast bends and stable at autobahn speeds. But steering feel is generally loose and numb; it’s tuned best for relaxed, one-finger driving. Brake pedal feel is also soft but secure. Driving an E-Class is exactly like riding in an E-Class, and that’s before activating the semi-autonomous cruise control. The car is so calm and noise-proof that you arrive, hours later, feeling refreshed. You almost forget you were driving in the first place. 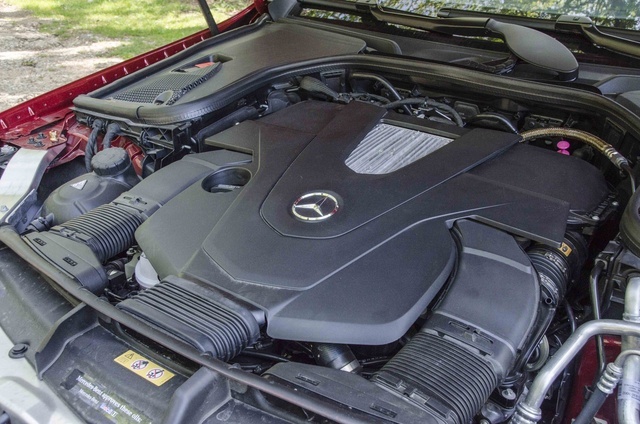 The E300 comes with a 2.0-liter turbocharged 4-cylinder engine with 241 horsepower and 273 pound-feet of torque. Rear-wheel drive (RWD) is standard, and 4Matic all-wheel drive (AWD) is optional except on the wagon and AMG trims. It’s not as responsive or refined as the 2.0-liter four in the BMW 530i, and it’s considerably slower than the outgoing E350’s 302-hp V6 without a lift in real-world fuel economy. We averaged 29 mpg in the RWD E300 over 460 mostly highway miles in Germany. My mother’s 2012 E350 4Matic averages 29 mpg on similar highway stretches, despite AWD and a much larger engine. (The E300 is EPA-rated at 22 mpg city, 30 highway; the E300 4Matic at 21/29). The little 4-cylinder is gutsy in the C-Class, but in the heavier E-Class, it’s just underpowered—and that’s with only one person in the car and no luggage. For 2018, Mercedes will again offer the E400 sedan, which has a 3.0-liter twin-turbo V6 shared with the previous-gen E400 and our new E400 coupe. That engine, with 329 horsepower and 354 pound-feet of torque, is the best choice. It’s quiet yet snarls pleasantly under full throttle, and while it’s not all-out fast, you can make safe passing maneuvers in an E400, which you never could in an E300. Despite nine ratios, the transmission is eager to downshift in Sport mode and upshifts without any vibration. This is the only powertrain currently offered in the coupe and wagon models. (The E400 coupe in both RWD and 4Matic is EPA-rated at 20/26; the E400 4Matic wagon is 19/25.) Over 600 miles, we averaged 23 mpg. Three overkill AMG models are available with stiffened suspensions and more aggressive tires. The AMG E43 sedan has a boosted version of the E400’s V6, with 396 hp and 384 lb-ft. The E63 S sedan is so heavily modified, loud, and rough-riding that it can’t be called an E-Class. Its 4.0-liter twin-turbo V8 makes 603 hp and 627 lb-ft of torque. That’s deadly artillery, and yet the E63 S can also be disguised as a family station wagon. 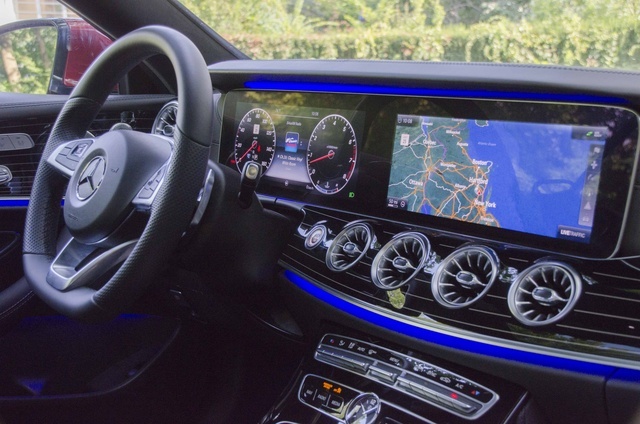 All E-Class models come standard with a 12.3-inch central navigation display that can be operated with a rotary dial, a touchpad, or a thumb pad on the steering wheel. A second thumb pad operates the smaller instrument-panel screen (or on cars like ours with the Premium 2 package, the thumb pad controls a second 12.3-inch display that takes over the analog gauges). These screens are bright and sharp. Thanks to a dash hood that Mercedes refuses to install on most models, they’re easy to read in direct sunlight. On the center stack, climate-control switches and a few buttons for audio, navigation, and car settings flank an analog clock. Otherwise, air vents dominate this space. But they’re not boring air vents—they’re big, beautiful bezels that twist and rotate with a fine precision. 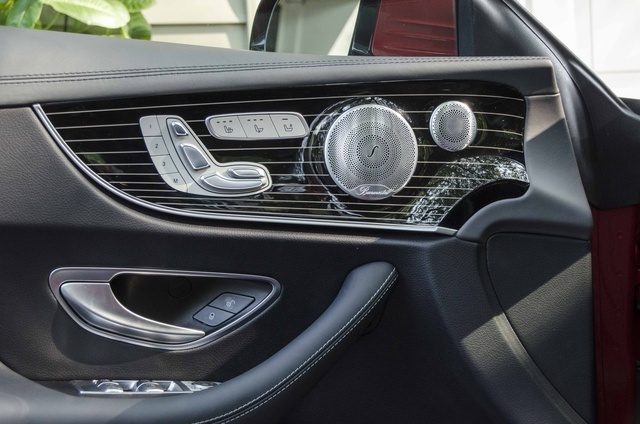 On the doors, Mercedes places its traditional seat controls (shaped like a seat) and includes switches for heating and cooling. But just about everything else is buried within the COMAND Touch infotainment system. That includes the seat massagers, lumbar, and sound settings. In an ordinary car, it would be simple to switch from FM to SiriusXM or dim the instrument panel brightness. In the E-Class, it takes several tries to master the exact process of submenus and the twisting, pushing, tapping, and swiping of the controls. And that’s just to change one of the settings. Form is most certainly over function, and while it’s gorgeous inside, the E-Class is several learning curves ahead of most drivers—and that's a recipe for distraction. When fully acclimated, the navigation display is the most enormous, clearest map I’ve seen outside a Tesla. Your right thumb can swipe and push through the many nav and system menus without reaching for the clunky touchpad on the center console. It’s usable and generally quick, but only after you’ve spent hours practicing in your driveway. The E-Class offers a large trunk in either coupe or sedan form, generous head- and legroom for rear passengers, and comfortable, supportive seats. 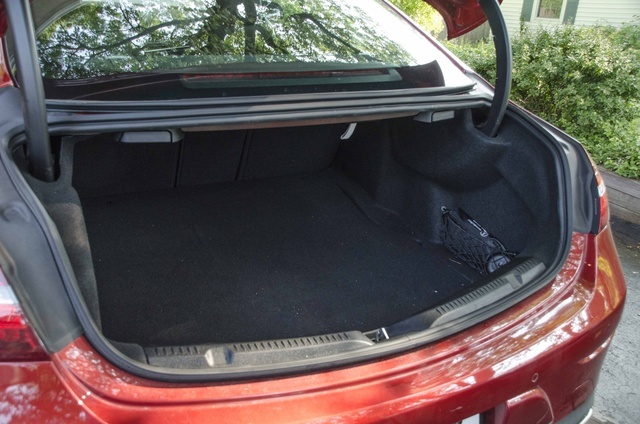 Even the coupe’s rear cabin is surprisingly spacious. The front headrests are powered, and on our car, the door and center armrests were heated. On a cool evening with all the windows down, I drove home from the gym getting a hot back massage while resting my elbows over warm, supple leather. It does not get better. I’ve mentioned much of the E-Class's technology already, if only to demonstrate how challenging it is for a first-time (and even a repeat) Mercedes buyer. Everything imaginable is here: dynamic traffic rerouting, single-string voice inputs, a Wi-Fi hotspot, Android Auto and Apple CarPlay, a built-in web browser, an automatic perfume dispenser, powered thigh extensions on the seats, bi-LED headlights, and a semi-autonomous system that can steer, throttle, and brake the car around turns. The Burmester stereo offers so many surround modes that you’ll never play music in your home again. The head-up display adds yet another digital screen to your arsenal, and the instrument panel can be configured in three different designs. Want the tachometer replaced with a large navigation screen? Done. Want the main screen split so you can see the nav while the radio is playing? Done. What about changing lanes on the highway without moving the steering wheel? Automatic parking? You can get everything and anything in an E-Class, provided you can spend $10,200 for the Premium 3 package. In the coupe, a powered seatbelt retractor hands you the belt so you don’t have to lean back. The windshield wipers have dozens of tiny holes within the blade so the washer fluid won’t squirt or run down the glass. The front cameras automatically engage when you pull up to a parking space. Nothing is ordinary. Again, Mercedes is tops with safety. Our car had optional rear side airbags (on the thorax level), which automakers almost never install on coupes or sedans. 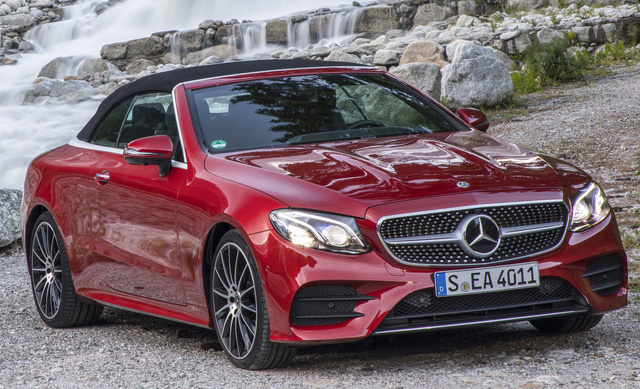 All E-Class models have what Mercedes calls “Car-to-X Communication,” which is an early form of vehicle-to-vehicle wireless networking that can send safety alerts (about things such as slippery roads and poor weather) to other E-Class drivers in the area. Pre-Safe Sound plays a “pink noise” during a crash to protect eardrums. In a side collision, the front seats can instantly shift the driver or passenger further from the door by inflating the side bolsters. The brakes can boost their stopping force if the driver doesn’t squeeze hard enough during an impending crash. The steering and brakes can negate the effects of surging crosswinds. If an obstacle is detected and the driver brakes, the E-Class can aid the driver’s steering around an optimum path. Automatic braking can detect crossing traffic as well as people. When adaptive cruise control is activated, the car can recognize changing speed limits and slow or speed up accordingly. Many of these features are optional, but many are not offered by other automakers. The E-Class scored a 5-star overall rating and 5 stars in frontal and side crash tests and for rollover vulnerability from the National Highway Traffic Safety Administration (NHTSA). It is rated a Top Safety Pick+ by the Insurance Institute for Highway Safety (IIHS) with the highest ratings in five crash tests, headlights, and collision-avoidance systems. Mercedes, like Volvo, studies real-world accidents in its own cars and for decades has led safety innovations well ahead of federal mandates. The E-Class starts at $53,945 for the E300 sedan and $56,445 for the E300 4Matic sedan. These are the most popular trims, and with the usual options, expect to see stickers in the low 60s. 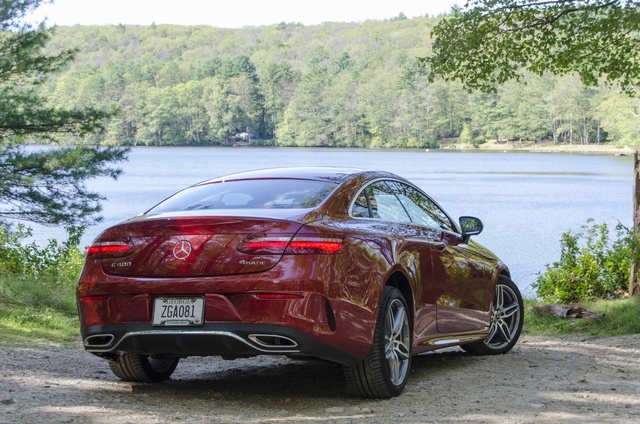 Our E400 4Matic coupe starts at $62,395—the price of a loaded C300 coupe—and still wasn’t fully loaded at $90,825. E63 S models sell for well past $100,000. Most of the safety and semi-autonomous features are locked into the absurdly expensive Premium 3 package. As I’ve said, you have the money, or you don’t. Either way, an E-Class loses at least half its value in three years, and on the used market they’re a fantastic buy coming off a lease. This is a superb car, but only if you can swallow the price tag. What's your take on the 2018 Mercedes-Benz E-Class? Ab I have e300 2018. Its nice option. But overpriced with full option. Car seats are uncomfortable and hollow to feel back pain. Nate Love our E43....lots of bells and whistles. Quick...and not to mention the loud biturbo gets your attention while driving or as an onlooker. The safety features are excellent! Ordered it in bed...had it delivered, so yeah...it’s definitely a game-changer! Users ranked 2018 Mercedes-Benz E-Class against other cars which they drove/owned. Each ranking was based on 9 categories. Here is the summary of top rankings. Have you driven a 2018 Mercedes-Benz E-Class? Enter your zip to see incentives for a new E-Class in your area. 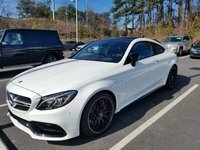 CarGurus has 22,400 nationwide E-Class listings starting at $1,500.